When a not-logged-in user creates a talk submission, they reach the Account page where they are prompted to create an account or log in to an existing account. The login and registration form should appear at the same time as page load so that people don't click the login link while they're waiting. Even a small loading wheel would make it better than it is now. Ideally, going to the normal login/registration page should not lose progress anyway. Submit a talk up until the account page. The login/registration box doesn't load for about a minute so you click the little login link in the top right corner. You're taken to the login/registration page which loses track of your almost completed submission. You can never get that talk content back now. 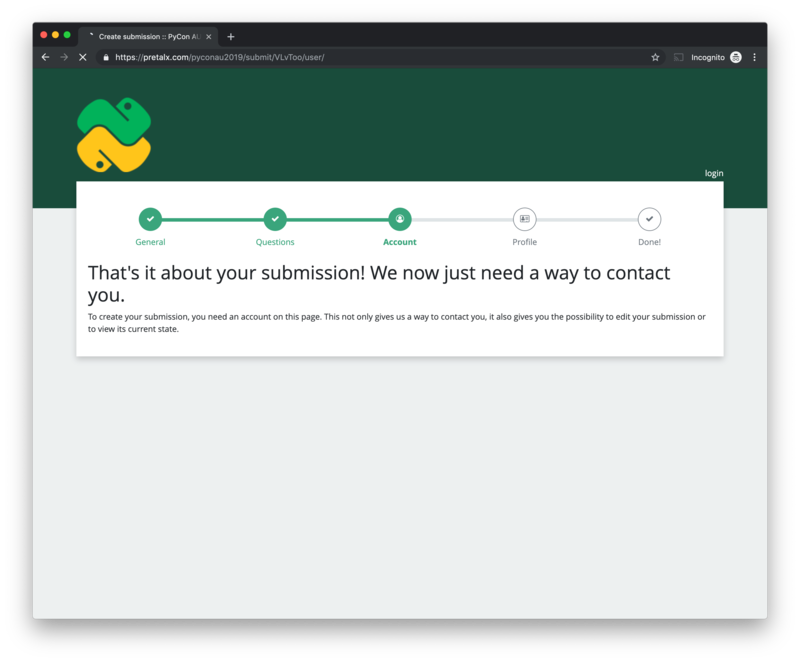 For PyCon AU, we're going to see a lot of unhappy people who lose their talk submission and we have zero way to contact them about it. This is going to be a big deal for us. I just pushed a commit that potentially fixes the issue (and makes other pages a bit faster, too). Could you have a look if this looks better for you now? It seems to have fixed the problem on my end, but I'm not in Australia (and I don't have a VPN available for tests atm). Side note: Going back a step doesn't work if you already clicked 'login' at the top right. Going back a step doesn't work if you already clicked 'login' at the top right. Huh, it really should – the data is saved at the URL you had open, after all. I'll try to look into it!